Primary pulmonary hypertension (PPH) is a rare disease. It is high blood pressure in the blood vessels of the lungs. A person with PPH has extra muscle in the walls of these blood vessels. That extra muscle makes it more difficult for blood to flow through them. 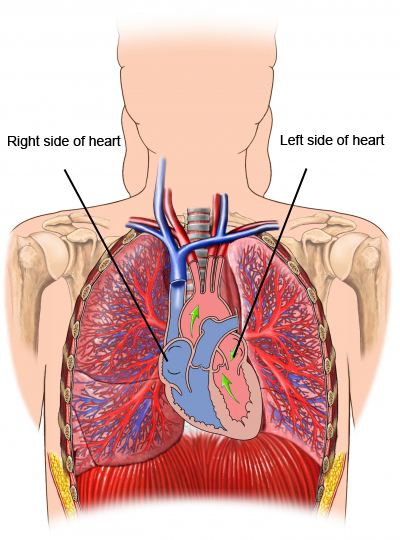 As a result, the right side of the heart has to work harder to push blood to the lungs. This additional strain can eventually lead to heart failure . PPH is a serious condition. It requires care from your doctor. Your doctor will ask about your symptoms and medical history. A physical exam will be done. Diagnosis of PPH may be delayed. It is hard to detect until symptoms worsen. If PPH is severe or other treatment methods fail, a lung transplant or heart-lung transplant may be needed. There are no current guidelines to prevent PPH because the cause is unknown. Explore pulmonary hypertension. National Heart, Lung, and Blood Institute website. Available at: https://www.nhlbi.nih.gov/health/health-topics/topics/pah. Updated August 2, 2011. Accessed September 14, 2017. Nuclear lung scan. Cedars-Sinai Medical Center website. Available at: http://www.cedars-sinai.edu/Patients/Programs-and-Services/Imaging-Center/For-Patients/Exams-by-Procedure/Nuclear-Medicine/Nuclear-Lung-Scan.aspx. Accessed September 14, 2017. Pulmonary arterial hypertension (PAH). EBSCO DynaMed Plus website. Available at: http://www.dynamed.com/topics/dmp~AN~T115043/Pulmonary-arterial-hypertension-PAH . Updated June 14, 2017. Accessed September 14, 2017. Pulmonary hypertension. American Lung Association website. Available at: http://www.lung.org/lung-health-and-diseases/lung-disease-lookup/pulmonary-hypertension. Accessed September 14, 2017. Pulmonary hypertension—high blood pressure in the heart-to-lung system. American Heart Association website. Available at: http://www.heart.org/HEARTORG/Conditions/HighBloodPressure/AboutHighBloodPressure/What-is-Pulmonary-Hypertension%5FUCM%5F301792%5FArticle.jsp#.Wbr2xrKGNxA. Updated May 23, 2017. Accessed September 14, 2017.